Also known as “Jumpers knee,” patellar tendinitis is an inflammation of the patellar tendon, which is the tendon that runs from the kneecap to the top of the tibia. 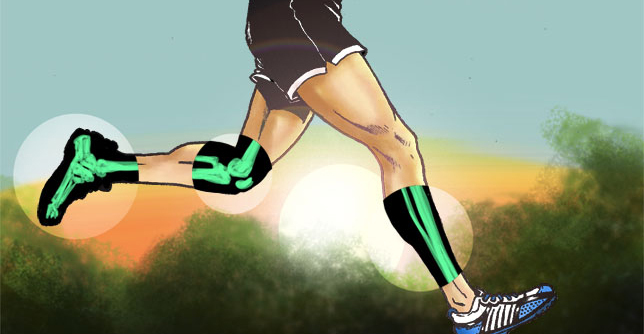 This vital tendon assists leg extension during running and other knee-bending motion, but the repeated high impact nature of running might place too much stress on the patella, resulting in small tears in the tendon, leading to pain and swelling. In most cases, patellar tendinitis pain is felt at the bottom of the kneecap—directly over the patellar tendon to be precise. However, the tenderness might take place anywhere along this structure. In most cases, the pain is worse when you do any knee bending activity, such as kneeling, squatting, sitting, jumping or ascending stairs. Some of the most common causes of the condition include overpronation (other biomechanical challenges), overtraining, and too much hill training. Not only that, if you do any sport that requires repeated stress on the knees can lead to the condition. Also, running on uneven or slanted surfaces might lead to the injury. First, step back from your running and/or drastically reduce your weekly mileage, giving your body the time it needs to begin the healing process. Next, ice the injured area for 15 to 20 minutes three to four time per day, and return gradually to your former running mileage once you can do it pain-free. First off, work on strengthening the muscles surrounding your knees, mainly the quads, hamstring and calves to provide more support to the patellar tendon and reduce the strain placed on the knees. Make sure also to stretch your hamstrings and calves on a regular basis. Increase your mileage by no more than 10 percent from one week to the next, making sure to make recovery a priority here. This entry was posted in Articles, Injury, Knee, Performance, Prevention, Running, Sports, Therapy, Training, Treatment by sportsmedicineweekly. Bookmark the permalink.